One of the mitzvahs of Purim is to give Mishloach Manot – giving gifts (usually of food and drinks) to friends, family and those in need. 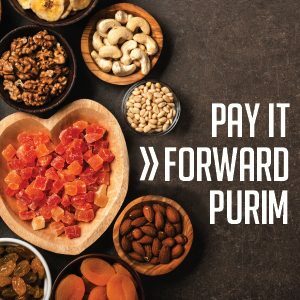 Join us March 26 as we Pay It Forward Purim. We will be giving out TWO mishloach manot to those experiencing homelessness on the streets of Toronto. One for themselves, and an additional one so that they too can fulfill the mitzvah of giving on Purim. After rallying into teams, a brief how-to and letting loose on the city, volunteers will go around and give out the Mishloach Manot as well as notes of inspiration. Let’s spread the holiday cheer! Two orgs are better than one! The House has partnered with Hillel UofT to bring you extra event goodness.